Ever since Akasha taught students from Ethiopia in Apple Valley, Minnesota, she has had a fondness for its culture and food. When we are visiting Minnesota, we often make a point to have dinner at her favorite Ethiopian restaurant, Fasika on Snelling. Looking at the travel sites only made us want to investigate further. 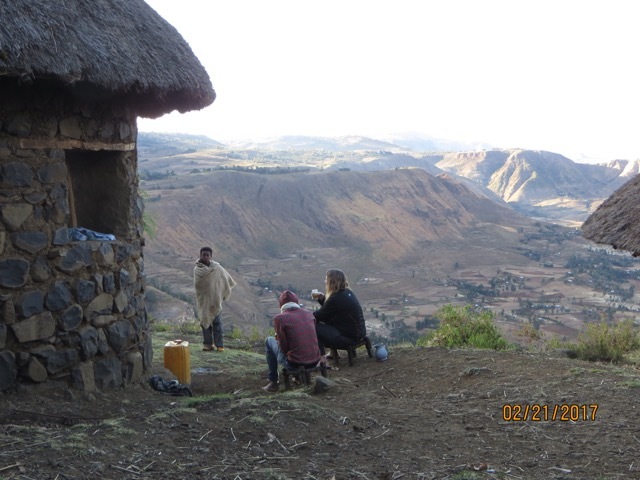 So with a week off in February, we booked tickets and asked our friend Kristen to join us, and our whirlwind tour of Northern Ethiopia was in place. We started early Saturday morning and we landed in Addis Ababa, late at night. We were there only long enough for a five hour nap, then we went back to the airport for a quick flight to Lalibela, an ancient capital best known for its 11 churches that have been carved down into the earth from solid stone. These churches were built 900 years ago by King Lalibela. His citizens were spending 3 months walking on pilgrimage to Jerusalem each December. So he consulted with bishops, built a pilgrimage site, and had it ordained. Since then, it has been the center of a vibrant Christian community and it remains a holy site for the country’s Orthodox population. Our paths kept crossing with a family dressed in elaborate clothing who were celebrating a recent wedding.They were enjoying the sight seeing and taking wedding photos. Later, Akasha met up with he family and found out the bride lives in Worthington, Minnesota. She had returned home to marry her sweetheart. It really is a small world. We had an amazing hike among the churches and through the landscape. It is still a mystery how they were carved down into solid rock hundreds of years ago. There isn’t evidence of where the rock they removed was taken to, though the king explained it was the divine work of angles. Our guide explained that it took 24 years, with men working all day and angels working all night. Because they are below ground, the path to many churches lay along narrow grooves carved into the stone. There were also tunnels linking the complexes together. One of them, ‘the road to hell,’ took us ten minutes to walk through, in total darkness. It was a bit scary but we came out alive! The top of St. George’s cathedral. The best known, St. George’s Cathedral, was one of the last to be built. It’s an impressive slab of stone with a huge set of crosses carved into the top. The ground near St George is also home to a troop of monkeys, who had no problem cavorting about on the churches and were happy to pose for pictures. 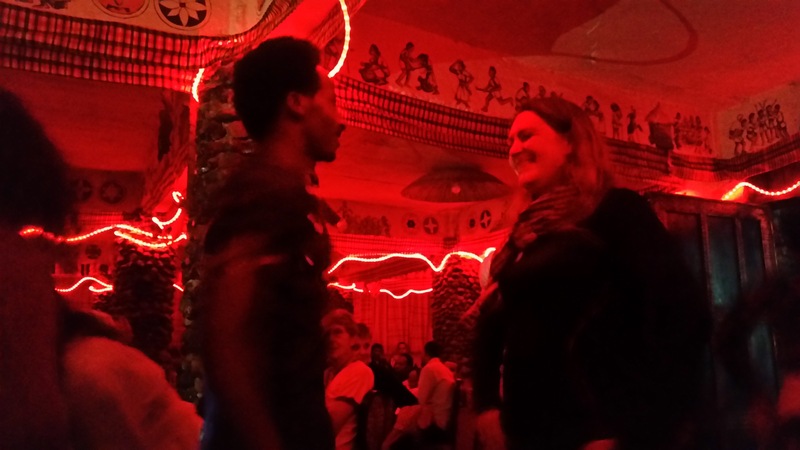 The legendary friendliness of Ethiopians was on display that evening, when we met a young man named Timothy, who offered to bring us to a local bar to see how Ethiopians enjoyed the evening. He brought us to a restaurant that served tej, the local mead made of honey and sorghum. The Tej House was off the main street and down a flight of stairs, and inside was a room lit with strings of red LED’s. Dancing in the tej house. It was the day before observant Orthodox began fasting for Lent, and the mood was a bit like Mardi Gras. A man strolled around the room playing a violin-like instrument with a single string called a Masinko, and a woman sang along while others danced and clapped. One of them coaxed Akasha and Kristen onto the dance floor to try out the shoulder-shaking, hip swaying moves of the locals. After a while we were joined again by the wedding party we’d met at the church, so it was quite a day of meetings and festivites. When it was time to leave, Timothy walked us back to our hotel, and though we kept expecting him to ask for a tip, he just hopped into a tuk-tuk taxi and left. It was a wonderful night, thank you Timothy! Then next morning we went on the road to hike among the canyons and farmland of the region. We took a tour that gave us three nights and four days in the farm country of this beautiful area. We should also mention our guide, Getnet, was a wonderful resource and good friend for the three days we knew him. Good-natured, knowledgeable, and friendly, we spent many hours chatting on the trail, and many nights exchanging stories around the campfire, and after our four day hike were sorry to lose his company. He was full of riddles and stories that he had collected from the travelers he met as a guide and we enjoyed sitting with him around the fire, trading and comparing adventure tales. Most of our hiking was over stony paths that bordered fields being tilled for the next season’s planting. The ground here is rich but full of stones, so the farmers have to work hard. They still plow the field behind a pair of oxen, persuading them to turn with a whip that sounded sharp as firecrackers. Everyone was very friendly and eager to shake hands and say Salem (hello), and the children all rushed out to greet us. The whole trip children ran out to us, waving and calling goodbye until they couldn’t see us any more. On our first evening, Kristen was lucky enough to spot a troop of baboons. Our guide, Getnet, led us down down to the valley floor, where the baboons congregated in a big troop to forage for grass roots. We watched them dig and walk, the babies riding the backs of the mothers while others played on the edge of a mostly dry waterfall in the golden light of the setting sun. Here we are, chilling on the canyon edge. The community lodges were amazing. Made of stacked stone held by straw and mud mortar, they all stood on the edge of huge canyons with spectacular views. We had huge beds and big windows that opened out to beautiful vistas. When we arrived sofas made of eucalyptus wood and leather were brought out for us to enjoy the view and relax while we drank coffee. Even the toilets had a great view, though if you took a mis-step you’d have a much faster trip to the valley floor than you wanted! And the people taking care of us were warm and friendly. They cooked dinner at night and breakfast in the morning, even roasting the coffee over a flame, right before they brewed it. 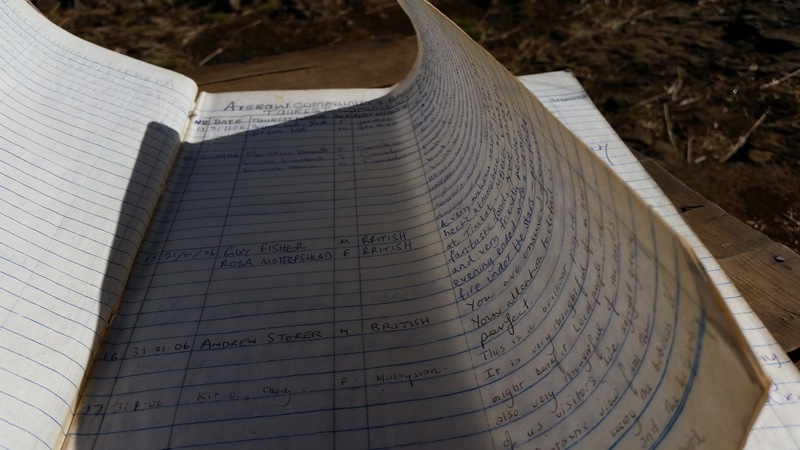 We signed the guest book at each lodge and it was amazing to see the names and comments from people going back to the first guest. Akasha in an Acacia tree. 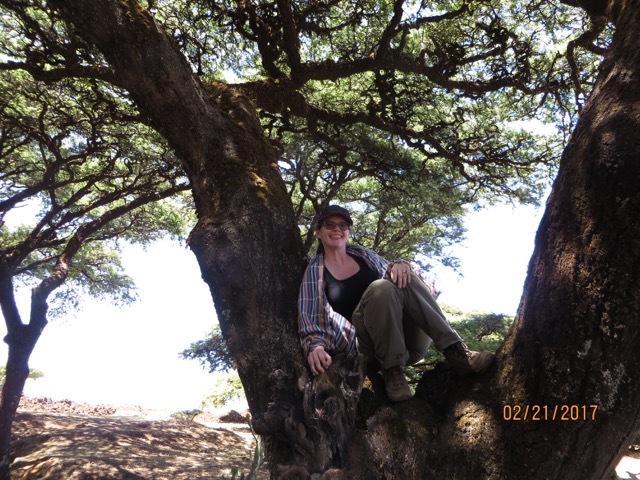 On our hike we enjoyed the trees and shrubs, from the aromatic sage to the noble thistle and the cutely named ‘monkey farts.’ One of our favorite trees were the ones that branched out to form a big canopy of ground cover, and Akasha was delighted to find out they were Acacia trees. So she of course had to climb one, and now we have a photo of Akasha in an Acacia tree, which makes the world that much more complete. And at night the sky was incredible with stars – we spotted Orion right away but had trouble finding the Big Dipper, usually the easiest constellation to find. It wasn’t till Mike played with SkyMaps for a while that we realized we were so far south, the Big Dipper was below the horizon, which never happens up north. It feels like a big world when even the stars change on you! A few hours drive from Lalibela, in the northwest corner of Ethiopia, kings of the old Ethiopian empire built castles. They were inspired by the Portuguese and the castles have a distinctly western feel. Built from 1606 to the early 1700’s, as a series of emperors built their own castle on the grounds, it has become a compound of great stone structures. We spent several hours here, in the old bedrooms and dining halls, saunas and courtyards. Although for us it was a brief stop, it’s a worthy goal for any castle-hunters looking for something off the beaten path, and like nothing you’d expect to see. South of Gonder is Lake Tana, the largest lake in the country and the source of the Blue Nile river. Here, we took a boat trip into the headwaters of the Blue Nile, where we saw more wildlife than we could imagine. Fish Eagles rested in treetops, cormorants stood on rocks, and hippopotamuses wandered in the shallow water. It was amazing to see them in real life, outside a zoo, even if we were only able to see their heads. One of them had a baby that poked its cute little head out! Then we crossed the lake, which has two islands that hold monasteries – one for nuns, the other for monks. On the far side we hiked around to see more churches. 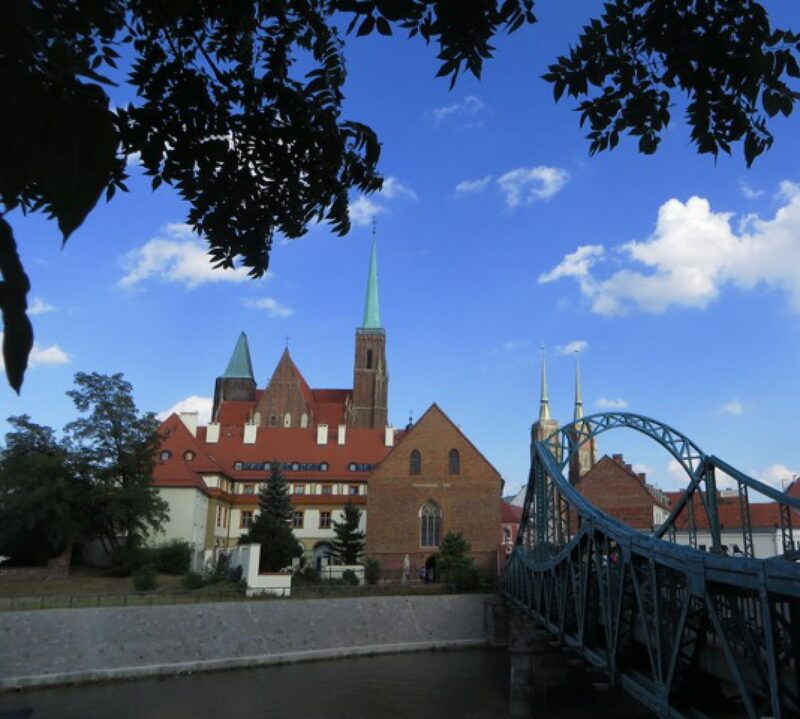 This was the hometown of our guide, and he happily showed us the local plants – ferns that curled up when you touched them, bean pods that made great spinning toys, and wild coffee plants, just starting to bloom. We only had a few hours in Bahir Dar, which was a shame. Our guide invited us to meet his family and visit his village, but we had a flight to catch. After all that, we had a day to spend in Addis Ababa, the capital of Ethiopia. 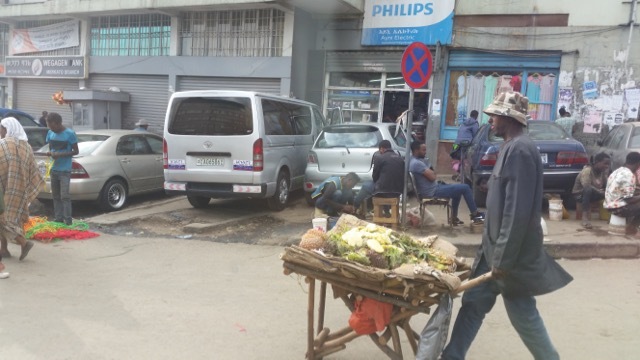 Addis has a population of almost 4 million people, and it seems like they are all on the street all the time. Every road is lined with pedestrians, and ad hoc marketplaces are everywhere. Even the road up the mountain to another royal palace was filled with people carrying loads of eucalyptus, donkey caravans, and tourist vans. We visited the fabric market, then drove through the Mercado, and stared in awe at the always-on bustle of an unfettered free market – you name it, you can find it in this sprawling landmark of the city. Well, it was a fantastic trip – we even saw Lucy, the 3.3 million year old human prototype (or a plaster cast of her bones anyway) – in the national museum! And this was just a small part of Ethiopia – there’s the whole southern section, with the Great Rift Valley, that we haven’t even gotten to. And of course there’s the entire rest of the African continent to find adventure in. So stay tuned, we’re not done yet!